Last Wednesday it was 60 degrees in New York which is really kind of scary for Winter time but I definitely wasn’t complaining. Especially since I had the day free to hang out with my little buddy rex and my good friend Ingrid. I was so excited to take Rex out to the park as we haven’t been there since the Summer. He loves to run around and chase squirrel’s lol. 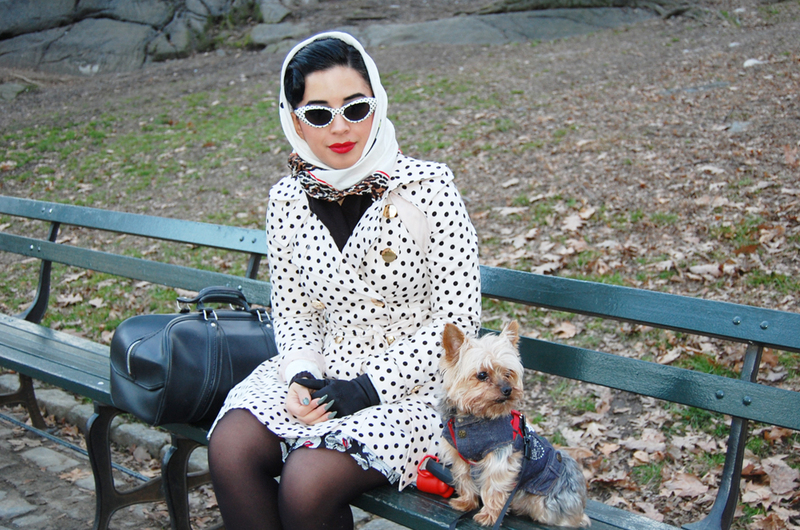 I was also excited to bust out my Top Shop polka dot coat that has been sitting in my closet awaiting warmer weather. 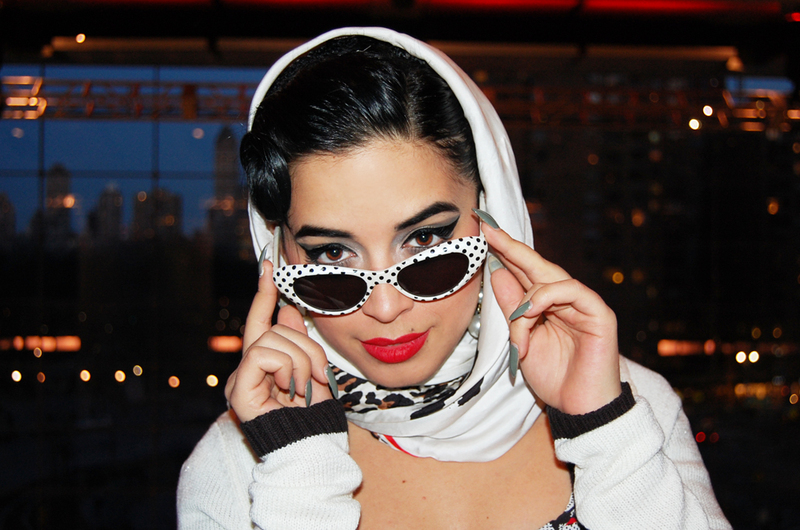 I was feeling very pin-up after watching the Prada SS 2012 so I threw on my Betsey Johnson head scarf, polka dot cat eye glasses, and my Forever 21 platform Mary Janes. If you haven’t seen the Prada SS 2012 video please do yourself a favor and check it out by clicking here. It exudes everything I am and more! 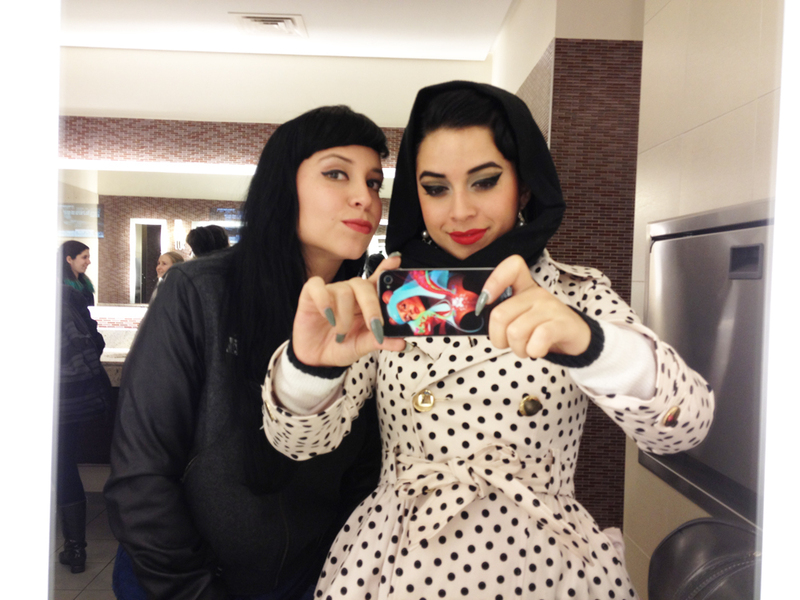 I also wore a Betsey Johnson “Betsey Babe” printed dress and cardigan that has been sitting in my closet as well, it made me want to go see the movie “My week with Marilyn” but I had little Rexy with me. 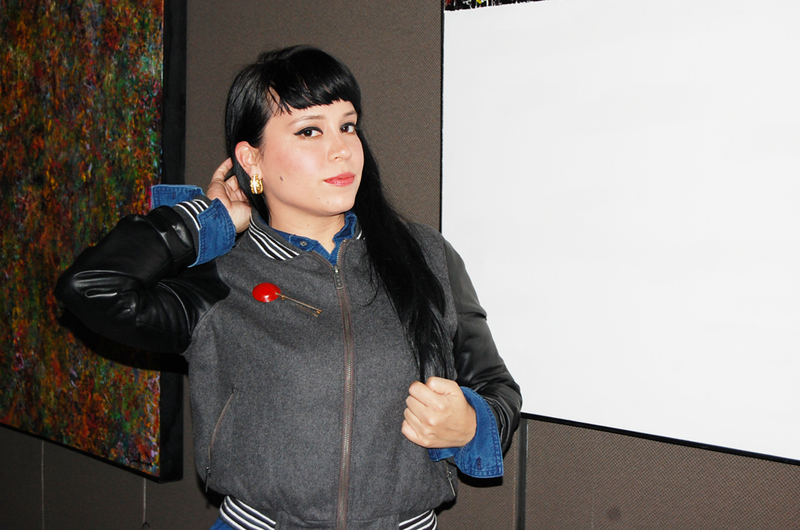 I wasn’t the only one showcasing my personal style..Ingrid wore a really amazing Zara varsity jacket that had pleather sleeves, an American Apparel boyfriend button-down, pleather leggings, and some really dope wedges you guys have to see! Last but not least, my little munchkin rex was dressed in a cute jean Fiorucci vest with cute patches attached to it. He is a little tough guy after all, I suppose I should dress him like the rock and roller he is lolol. Check out more photos inside! Me and my baby<3 It was an all around perfect day of perfect weather and it was nice to just relax at the park. My baby Rex in his Fiorucci biker vest. Such a rebel lolol. My vintage doctors bag comes with me everywhere so do my black gloves from the 50s. My friend Ingrid has great personal style, she always looks great. Rexy likes her too 😀 lolol too cute. I love this picture! Off we go! lol I’m quite the character. Black makes a great contrast when you have lots of patterns on. I love love love Ingrid‘s outfit! So pretty! Can we talk about her wedges? awww<3 After the park we ventured off into the Time Warner building to check out some shops. 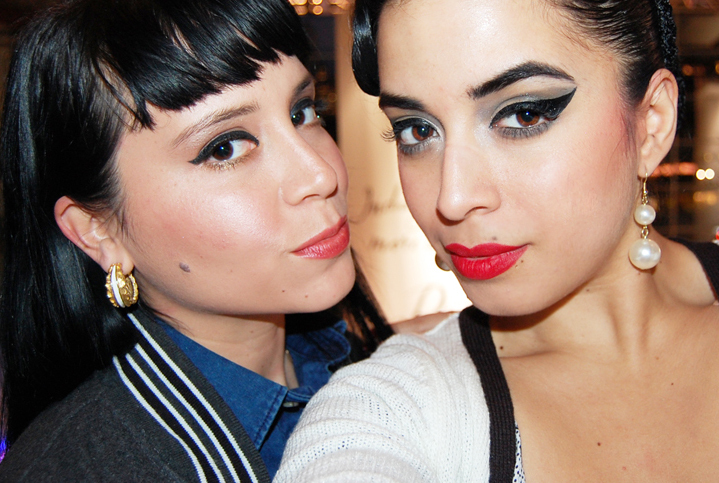 It is hard to get pics of us together when there is only two of us lololol. I switched my scarf because it got a little colder out as the sun went down. Thelma and… Louise. Trouble in Betsey Johnson. 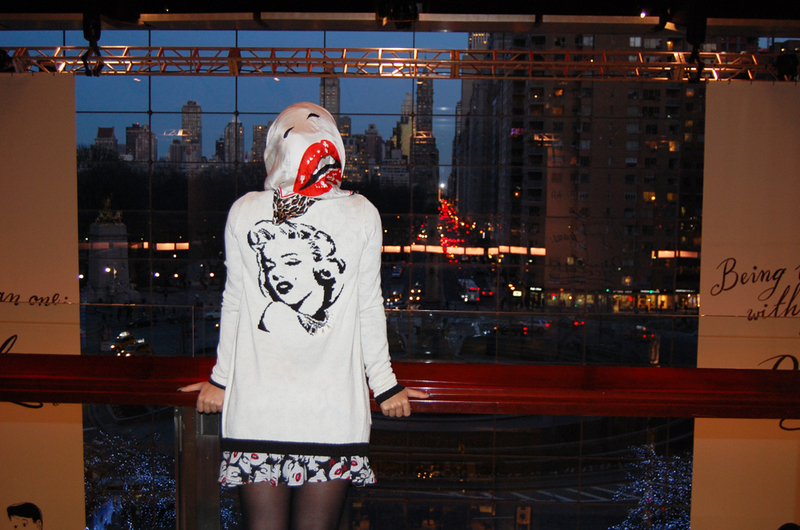 The scarf, the dress, and the cardigan…alll Betsey.<3 Love this print! Comfy Forever 21 platforms! I wear them to bits! I love the menswear inspiration behind Ingrid look. She does it so well and still keeps her femininity. ← Societe Perrier interview & feature! Loving all the pops of polka dots! J, that dress. Girl, Yas!